This condo can be used as either a one or two bedroom apartment and is part of a beautiful property setting (Park Shore Resort) with individual units surrounding a tropical island holding a large swimming pool, a sun deck, large barbeque area, outdoor whirlpool, the Island Pub restaurant and beautiful tropical landscaping. Private tennis courts and a racquetball court are part of the Resort. Of all units, this one has the most striking view of the island, from the second floor balcony vantage point. Take the elevator down and a brief walk for a dip in the pool or a sunbath, under palm trees. While not part of the Park Shore rental pool, the apartment is embedded in a condotel surrounding offering a reception desk, with the phone switchboard also serving this unit. This paradise is well sheltered from the outside yet shops for all daily needs - supermarkets, Walgreen's, fresh food marts etc. - and banks, post office are within easy walking distance. The sandy Gulf beaches are just 1 mile away (some people bike the distance). The neighborhood is upscale single family homes, abundant with restaurants (at least 6 in walking distance). Washer and dryer are in the unit, there is also a coin-operated laundry facility on the location, ample parking space is available and the main traffic artery, US 41 'Tamiami Trail' is only two blocks away. Numerous golf courses in the neighborhood offer green fees and seasonal memberships. Naples downtown facilities are within easy reach. Tenants can obtain a beach parking permit for rental cars for a nominal fee from City Hall, request rental documentation from front desk. Please note no pets are allowed on the property. No smoking permitted. Beautifully landscaped property. Second-story view of meandering creek, lighted waterfalls and fountains and beautiful swimming pool. Condo has all amenities including and especially a well-equipped kitchen. An older property now, and those who reside in the resort are primarily older couples. Grocery shopping and drug store only a five-minute walk. We have stayed twice now and will likely return again. This condo was very comfortable; light & airy decor! It had all the conveniences you could ask for--well equipped kitchen. Everything that I needed was there! 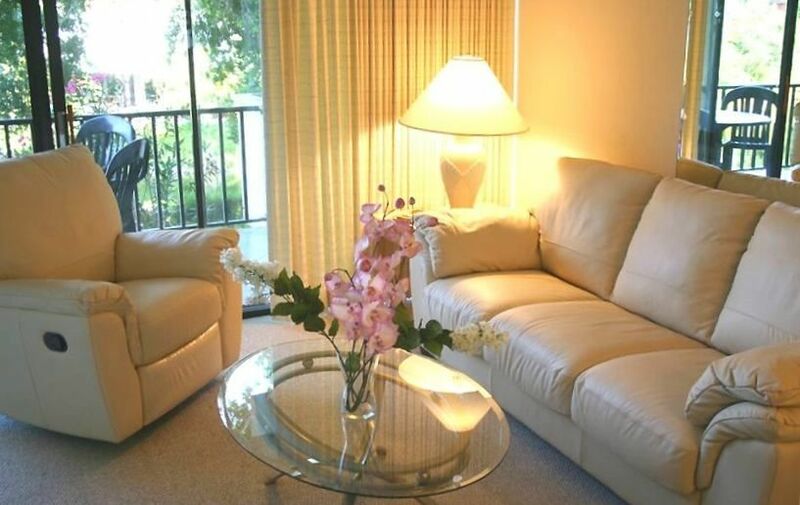 Superb location--within 5 minute walk to restaurants, shops, & grocery stores. I walked to the beach almost every day as it was just 15 minutes away. I loved to sit on the lanai as my view was overlooking the lake & swimming pool. The owner was wonderful to work with & very responsive with any problems or questions. This was truly a perfect location for relaxing & day trips! I would highly recommend this condo for anyone who comes to the Naples area. This was our first experence visiting Naples. The excellent location, charming setting, satisfying and complete amenities all made it a fabulous vacation. We arrived a bit skeptical of the superlatives of the description but found the particular unit lived up to every claim and more could have been made. It is beautifully maintained and generously equipped for the traveller with unexpected amenities such as beach chairs and umbrella, some spices and condiments, rudimenatary supplies. When the inevitable emergencies came up they were swiftly handled by the owner despite his distance away. His cooperative thoughtfulness was most appreciated throughout our dealings with him. Electronic key cards will be issued at Front Desk upon check-in. No pets allowed by Condo Association. Credit card will be scanned for possible telephone switchboard charges.